Succulent jumbo shrimp are wrapped in prosciutto then skewered along with sweet pineapple and grilled for just a few minutes. Then they are laid atop chewy, nutty black rice with mango with a spicy rum butter sauce!! Talk about a tropical delight on a stick!! 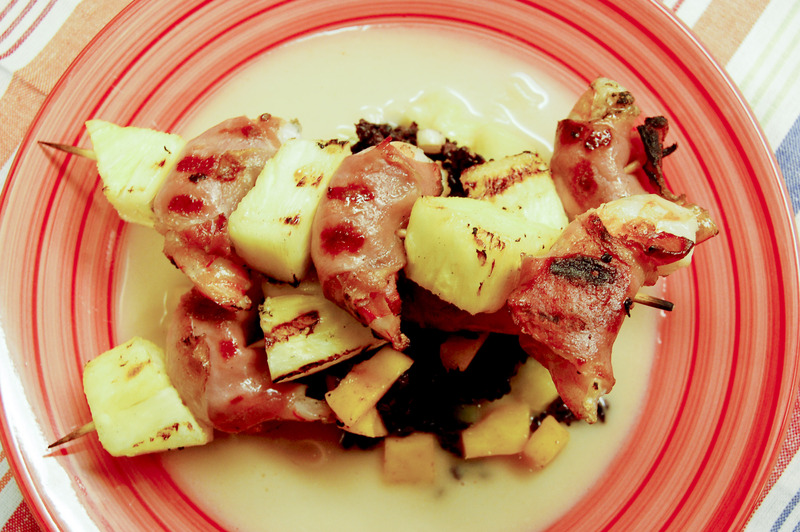 Succulent jumbo shrimp are wrapped in prosciutto then skewered along with sweet pineapple and grilled for just a few minutes. Then they are laid atop chewy, nutty black rice with mango with a spicy rum butter sauce!! Talk about a tropical delight on a stick! Soak 4 wooden skewers in warm water, while preparing the shrimp. Remove the shells and de-vein the shrimp and set aside. Slice the prosciutto in half lengthwise to make 12 long pieces. Wrap each slice of prosciutto around a piece of shrimp, until all the shrimp are wrapped. Cut the pineapple into large pieces, about the size of the shrimp. Skewer the shrimp and pineapple alternating on each skewer until all the shrimp and pineapple make 4 skewers. Preheat the grill to about 400 degrees. Grill the skewers for about 1-1/2 minutes each side for a total of 3 minutes. Add the 1/2 cup rice to a small pot. Add the water, a little salt and pepper. Bring to a boil then, cover with a lid and turn down the heat and simmer, stirring occasionally for approximately 30 minutes. Once all the water is absorbed and the rice is tender, add the cut spring onions and diced mango. Serve with butter sauce and shrimp skewers. Add the shot of Captain Morgan Rum and green onions to a small sauce pot. Turn up the heat until it begins to boil. Continue until the liquid is almost evaporated (about 3 minutes). Once most of the liquid is evaporated, turn the heat to the lowest setting and begin to add the butter, one tablespoon at a time while whisking to create an emulsion. Continue adding the butter and whisking constantly until all the butter is incorporated into the sauce and its frothy. Add the cayenne and salt and pepper to taste. Serve over top the rice. *The rice and butter sauce can be made ahead of the skewers, just keep on very low heat until the skewers are done.